The depicted Deutzia Gracilis has apparently begun suffering from some kind of invasion. Who is bugging it (probably aphids) and how can this be fought off (preferably without "strong" pesticides)? 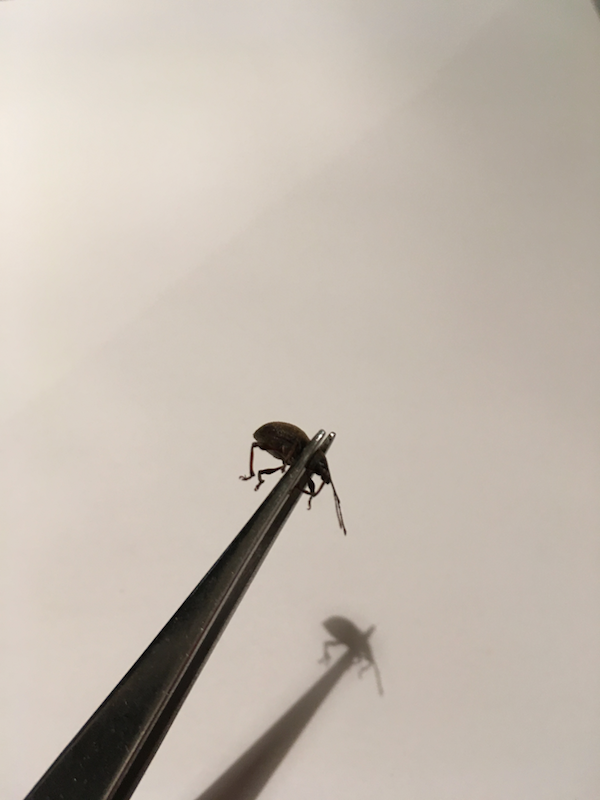 UPDATE So I was able to catch the/a likely suspect at night (see 4th picture), probably a Vine weevil. RIP. 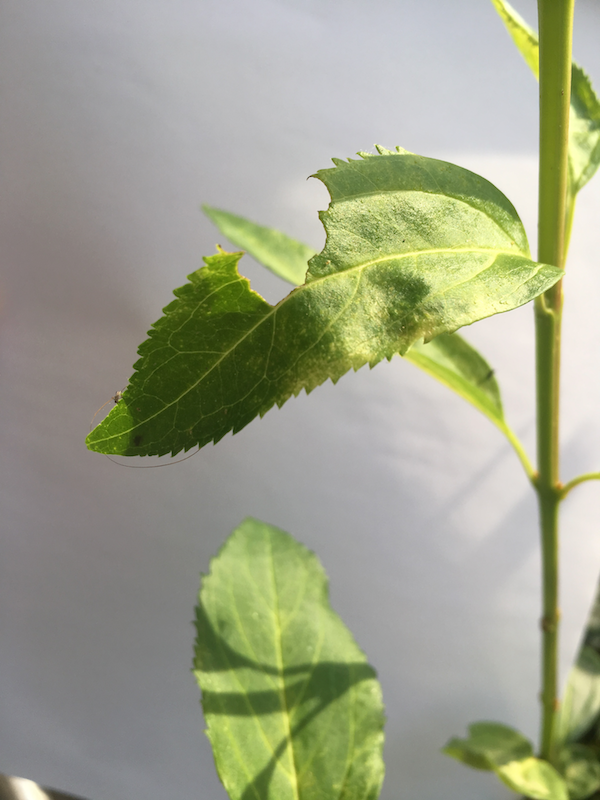 UPDATE On reflection, the plant of concern my be Forsythia intermedia, not Deutzia gracilis. Yes you've got visitors. They come at night so if you've a flashlight, go out at night to check on these visitors. Not at all a big deal, Drux. Your plants are not healthy for two reasons that I can suss out; one is light and the other is fertilizer. The internodes are extremely long (too little light) and your leaves show that the photosynthetic factories are DOWN (too little nitrogen). Without the right amount of chemistry (fertilizer) and light and water and air and proper soil...you will get anemic looking plants. To be healthy and the right color of green you need to add a balanced fertilizer. Don't lump fertilizer into 'bad chemicals'...please. 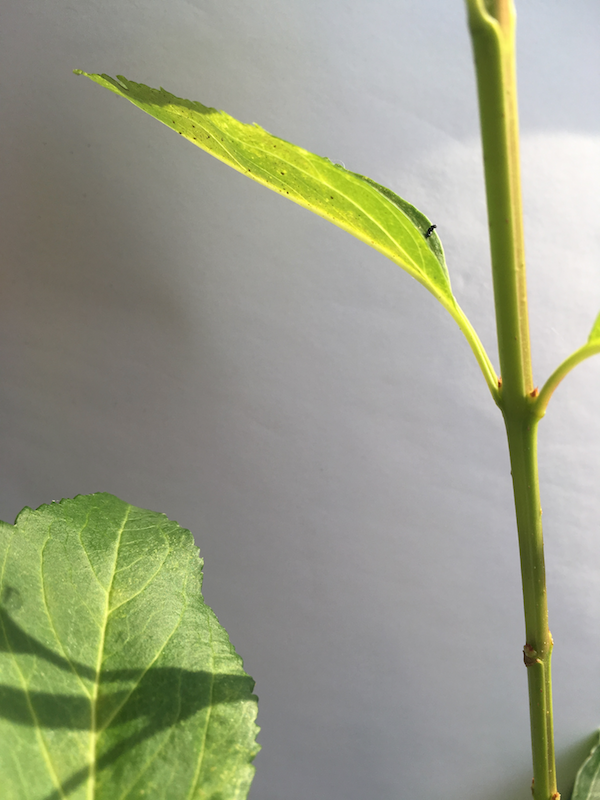 Plants that are susceptible to insects and disease are usually plants with little or no chemistry added to the soil with which they they are able to compete, survive because they need to make their own food...Any problems you see are most likely because this plant has had no added balanced fertilizer. Photosynthesis doesn't work without the proper ingredients at the proper amount. Without a human who understands the chemistry, just the basics, no added fertilizer, one will have plants 'on their last legs'. Weakened plants put out neon signs saying, "I am weak and easy to eat"...what have you added for fertilizer? If you've added a balanced fertilizer then we all need to go back to the drawing board! Looks like your potting soil came with fertilizer, balanced? Found 5-4-6 on one of the fertilizer products. So this is in favor of too much fertilizer? They say you need to add your own fertilizer after 5 months? How long has it been since you transplanted this plant? Looks like it has used up what little fertilizer was added to the potting soil and you need to start your own program of fertilizer. Osmocote 14-14-14 would be perfect. Use half the amount specified in the directions. Extended release so you only need to do this once per year. Not the answer you're looking for? Browse other questions tagged identification diseases pests or ask your own question. 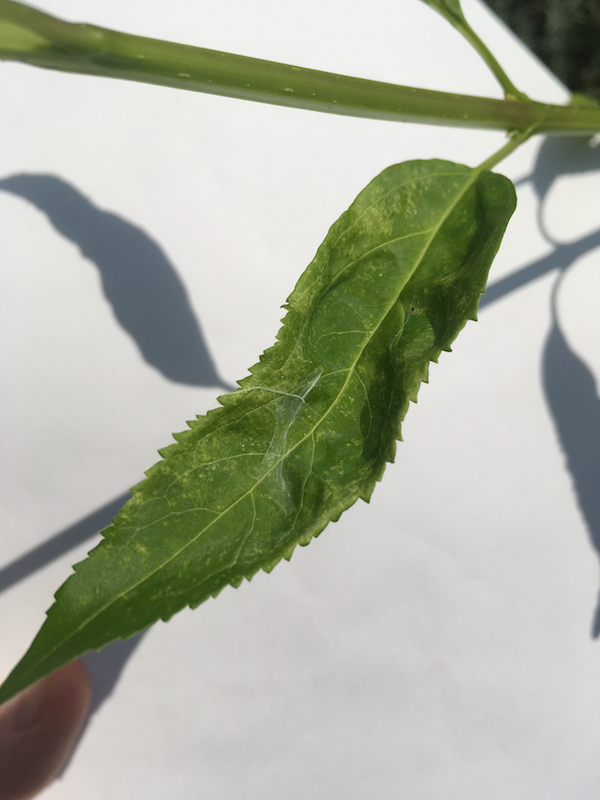 Is this the tomato potato psyllid?